Zabriskie Point Update: Closed from December 1, 2014 - March 31, 2015. When the project commences, all access to Zabriskie Point and surrounding area will be closed for major rehabilitation work to repair unstable support walls and improve conditions. CA Hwy 190 will remain open to through traffic. Death Valley was a daunting obstacle to pioneer settlers and miners entering California during the Gold Rush of 1849. But only one 49er is known to have perished crossing Death Valley. Fifty years later, it was a center of borax mining and today, its extreme environment attracts campers, hikers, nature lovers and tourists from worldwide. Death Valley National Park is the largest national park outside of Alaska. Death Valley forms part of the Basin and Range Province of the Great Basin Desert. It is similar to other basins of the region, but is unique because it contains the lowest, hottest, driest location in the western hemisphere. Nearly 550 square miles of its area lie below sea level. Ecologically, its plants and animals are representative of the Mojave Desert. Most of the surface water in Death Valley is in saline ponds and marshes around the salt pan. 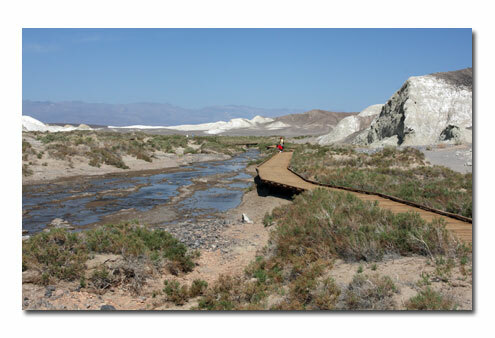 Most of the year the bed of the Amargosa River is only a series of dry channels. The river brings some water into the southern end of the valley from desert areas to the east, but most of its flow is underground. Salt Creek, draining the northern arm of the valley, also has only short stretches of perennial surface flow. At times in the past, much more water reached Death Valley. During the Wisconsin Glacial Period of the Pleistocene Epoch, (about 50,000 years ago) a body of water -- Lake Manly -- filled the valley to a depth of 600 feet. More recently (from 2,000 to 5,000 years ago), a shallow lake occupied the valley floor. Evaporation of this lake created the present salt pan. Designated National Park: Signed into law October 31, 1994, the Desert Protection Act (DPA) added 1.3 million acres to DeathValley National Monument and promoted it to National Park status. DPA also designated 3.1 million acres of the park as wilderness. Despite the harshness and severity of the environment, more than 1,000 kinds of plants live within the park. Those on the valley floor have adapted to a desert life by a variety of means. Some have roots that go downward 10 times the height of an average person. Some plants have a root system that lies just below the surface but extends out far in all directions. Others have skins that allow very little evaporation. There is no plant life higher than the microscopic level on the salt pan, but salt-tolerant Pickleweed, Saltgrass and rushes are scattered around the springs and marshes at its edges. Tamarisks offer shade around some of the springs and in the inhabited areas at Furnace Creek. Mesquite abounds where water is less salty. Creosote Bush populates the alluvial fans around most of the valley, giving way to Desert Holly at the lowest elevations. Cactus is rare at the south end of the valley but abundant on the fans farther north. Spring rains encourage a variety of desert wildflowers. As elevation increases, so too does moisture. On the higher mountains slopes, Juniper, Mountain Mahogany, Pinyon and other pine forests are prevalent, surrounded by peaks covered with snow. Different forms of wildlife have also learned to adapt to the extreme heat. The variety of animals that live in the desert are primarily nocturnal and are, therefore, not easily observed. But night is the time of innumerable comings and goings by small desert animals. Lizards are numerous, but snakes comparatively rare. Several forms of desert Pupfish live in Salt Creek near the Visitor Center, Saratoga Spring in the southeast corner and other permanent bodies of water in the valley. Rabbits and several types of rodents, including Antelope Squirrels, Kangaroo Rats and Desert Wood Rats, are preyed upon by Coyotes, Kit Foxes and Bobcats. The largest native mammal in the area is the Desert Bighorn Sheep. Small herds of the Bighorn are found at cooler, higher elevations but occasionally can be seen on the valley floor. More than 200 species of birds are known to visit the Death Valley area but few are residents. Wild burros, descendants of animals lost or abandoned by prospectors and miners, became so numerous they overgrazed the natural vegetation and endangered native animals who are dependent upon it. The burros have, for the most part, been rounded up and removed from the park. The geologic history of Death Valley is complex and involves different types of fault activity at various times, as well as crustal sinking, volcanic activity and erosion. 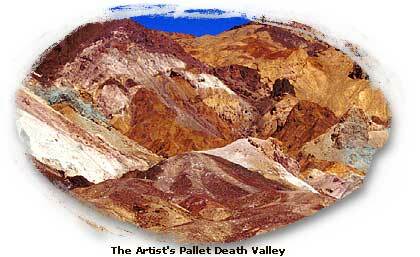 Death Valley is a graben -- a rift valley -- formed by the sinking of the bedrock lying between parallel, uplifted, tilt-block mountain ranges to the east and west, the Amargosa and the Panamints. A type of fault activity called block faulting, in which huge pieces of rock move vertically, began to form Death Valley about 30 million years ago. The sinking of crustal blocks and the uplift of the adjacent mountain ranges to form the great depression has been occurring for millions of years and continues to the present time. As the mountains rose, erosion began to wear them down creating the numerous sedimentary deposits and alluvial fans. Intermittent streams, resulting mostly from bursts of infrequent rain, rushed down the steep canyons scouring boulders, soil and debris, then depositing it on the valley floor at the canyon's mouth. As the valley sank, it was filled with sediments eroded from the surrounding mountains. In the central part of the Death Valley, the bedrock floor is buried beneath as much as 9,000 feet of sediment. On any given day, this valley floor shimmers silently in the heat. The air is clear -- so much so that distances are telescoped -- and the sky, except perhaps for a wisp of cloud, is a deep blue. Six months of the year unmerciful heat dominates this environment. For the other six, the heat releases its grip only slightly. Rain is rarely allowed past the guardian mountains to the west. The small amount that does arrive, however, provides the life force for the explosion of wildflowers that transform Death Valley into a vast colorful garden each spring.